The French for slam is the regular ER verb claquer. To remember this, imagine you slam and slap CLACK Kent - brother of Superman! claquer can also mean: to slam shut; to bang; to click; to crack (whip); to slap. - une claque (nf) : slap. / un claquement (nm) : slam. - faire claquer des mains/ses doigts : to clap one's hands/to click one's fingers. - se claquer (un muscle) : to pull or strain (a muscle) / to wear oneself out (fam). - en avoir sa claque : to be fed up (to the back teeth) (colloquial). Give yourself a slap on the back, make quick and easy progress learning French using proven techniques like Cartoon Memory Triggers. To remember a word, just think of the pic! slam! claque ! claquons ! claquez ! ✔ Claquer is a regular ER verb. There are over 5,000 ER verbs these being the most common verbs in French. ✔ Learn claquer and it will reinforce the pattern for ALL those other ER verbs. ✔ You can more easily remember words and verbs like the French for slam - claquer using the techniques of the world's Memory Masters. 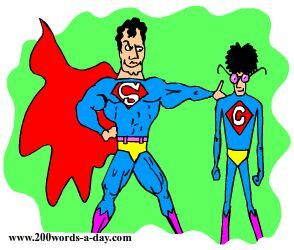 200 Words a Day! Free Daily French Lesson Online - the verb in French for slam is claquer - fully conjugated. French Learning Made Fun and Fast with your free Daily French Verb Lesson - claquer.